E-Newsletter position you and your company as an industry thought leader. E-Newsletters are cheap to send, inherently interactive, and easily forwarded to friends of friends. E-Newsletters give you an opportunity to reveal your “human side,” to show potential clients and customers that you’re more than just a vendor. All great stuff. But here’s the problem: You don’t know how to write, when to publish, which formatting details matter, how to grow your list, where to get content ideas, and on and on and on. It’s a great idea, but where do you start and how do you create something that’s worth sending? That’s what this e-book is all about. 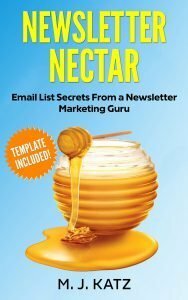 You’ll also get a 5-page E-Newsletter Launch Template and Checklist to systematically guide you through the thought process of your E-Newsletter. The template pulls the concepts and guidelines detailed in the book into a straightforward, simple tool that you can use as you prepare to launch.